Samsung and Harman Kardon launch Dolby Atmos and DTS:X soundbars | What Hi-Fi? The soundbars will be the first products to bear the Harman Kardon logo since Samsung's acquisition of Harman International back in 2016. Dolby Atmos soundbars aren't a new phenomenon, but we haven't come across many that include DTS:X support in the same package. Both soundbars use up and side-firing speakers that Samsung claims "move sound naturally above and around listeners". 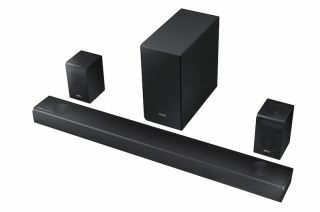 The HW-N950 is a 7.1.4 set-up, and includes two wireless surround speakers and a wireless subwoofer, while the HW-N850 drops the channel count to 5.1.2 and loses the wireless surrounds. There are no pricing details at the moment, but Samsung claims both bars will sit in the "premium category". Our guess would be somewhere around the £700-£1000 mark. We've already seen the likes of LG team up with Meridian in an attempt to boost the audio of some of its own products, such as the LG SK10Y Dolby Atmos soundbar. It was a solid effort and a decent improvement on LG's previous offerings, so can Harman Kardon influence Samsung in a similarly positive way? We shall see. DTS:X - what is it? How can you get it? Dolby Atmos: What is it? How can you get it?